What do you know, we had a sneakily higher month for pageviews! I have been so discouraged by the analytics lately that I haven’t been paying much attention, so it was a nice surprise when I finally looked at the numbers. I’m sure it was due to my GRS guest post and the post I put up to direct new visitors to previous posts. 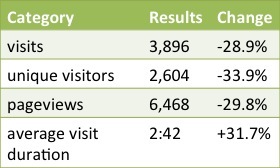 It was our highest month for pagviews, though not quite the highest for unique visitors. We also got quite a nice bump in average time spent on the site – also highest ever. Anyway, the really nice thing this month was getting a few attaboys from people I know IRL who read the blog. A few people at FPU asked for the URL and I some encouragement about my writing from them, and one of my friends referred to EPF in our small group during a discussion about finances. That made me feel really nice – like I’m doing something okay over here writing- and content-wise even if the blog isn’t really growing in readership. This section is still developing, as you can tell from my updates in the last few months. I’m only reporting the money we’ve actually received, and it’s a bit difficult to wait on the payouts! tons of searches for reviews of Republic Wireless! How long does it take for payouts to come from affiliate networks? Do you ever let your IRL and internet relationships cross over? What do you find rewarding about blogging? 10 Responses to "Blog Statistics Update October – November 2013"
Becoming an irl reference for your friends is so cool. I still haven’t told most people I know that I wrote about financial topics online. I think about blog growth sometimes, and I’m still not sure how it works. 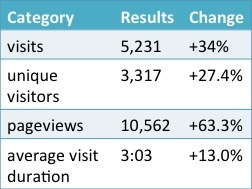 Do we get more engaged readers or just more active search results? I’m think most of the growth come from search. I agree, traffic growth is mostly from search, but I would love to have more search traffic, a small percentage of which turns into engage readers! We’re mostly anonymous so the only people that we actively talk with about the blog IRL are Mr PoP’s parents. But friends know personal finance is of interest to us and often ask our opinions on things hey are trying to sort out in their own finances. We stopped tracking growth like this a while back. It didn’t feel worthwhile for what we like to get out of the blog, which is more about having discussions and maintaining focus and accountability on our own financial journey. I agree that’s what I get out of blogging as well. I don’t mind checking the rankings and stats once per month and I don’t monitor nearly as closely as I used to. Looking good Emily, keep it up! I don’t publish my blog stats currently but mine is still pretty young. I’ve not had any affiliate sales yet, much less payouts. Need to learn a little more on those! It’s been a slow learning process for us, but I’m much more into generating content and networking. I most certainly let RL and blog cross over – I meet bloggers, and I tell most people about my blog! I shall use the blog as a pictorial gift list for Christmas partly cause it’s simple, pretty and might help people! It also keeps me mindful to be ‘nice’ on my blog and to stay somewhat away from other people’s specifics, though mine are fine! I don’t get any $$ for blogging, so can’t help you there! I do watch my viewing stats, but that’s about all! SarahN recently posted..Savings target: oh so close! When have you met bloggers? That is exciting! dojo recently posted..Home based business: how flexible are you when it comes to working during weekends?